If you gauge vocal artistry solely on which singers you routinely hear on today’s popular radio stations, you’re doing yourself a real disservice, especially if channel surfing in your city hasn’t exposed you to the dynamic talent and six-octave range of vocalist and musician Rachelle Ferrell. Ferrell’s vocal arsenal is in a word “amazing.” In fact, few artists can match the awesome combination of God-given gifts that she possesses, particularly when considering her vocal range, phrasing and overall musicianship. Classically trained in violin and piano in her formative years, she first began singing when she was six years old. Her album, “First Instrument,” was released in 1990 in Japan – five years prior to its U.S. release, and remains one of the most outstanding examples of a vocalist taking jazz standards and making them their own. Her rendition of Sam Cooke’s “You Send Me,” Cole Porter’s “What is This Thing Called Love,” and Rodgers and Hart’s “My Funny Valentine” illustrate her vast array of talents and why she has since captured the hearts and souls of jazz aficionados. But jazz is not the only genre that this singer, who can “wail like Minnie Ripperton,” has mastered. Prior to embarking on her solo career, she sang backup for the likes of Lou Rawls, Patti LaBelle, Vanessa Williams, George Duke, and this writer’s personal favorite, Phyllis Hyman. With the release of her album in 1992 consisting of self-penned originals, including the heartfelt duet with Will Downing, “Nothing Has Ever Felt Like This,” she began to build a solid base of U.S.-based, R&B fans. Still, you can’t help but be impressed when you consider some of the jazz musicians with whom she’s worked and recorded: trumpeter Terence Blanchard; bassists Stanley Clarke, Kenny Davis and Tyrone Brown; pianists Eddie Green, Gil Goldstein and Michel Petrucciani; drummer Doug Nally; and saxophonist Wayne Shorter. 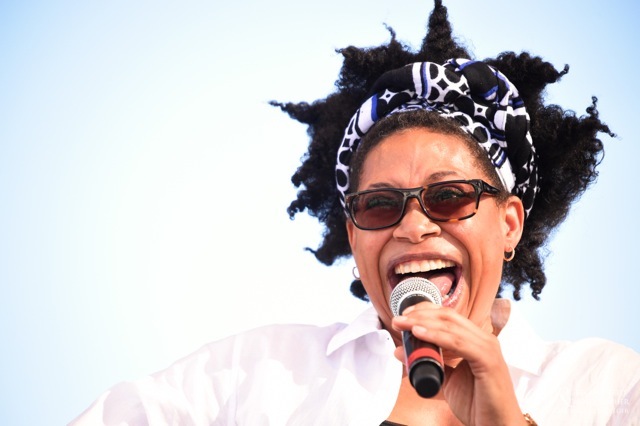 This writer caught up with Ferrell after a performance that brought the crowd to its feet during her appearance at the recently-held Ninth Annual Jazz in the Gardens in Miami Gardens, Florida. As always, she was candid in her remarks and gracious with her time. According to Ferrell, when she penned what would eventually become one of her most-requested songs, the above-mentioned duet with Downing, she never expected it to be so well received. And while she’s understandably proud of its success, she notes that as the song took shape, she had one specific purpose in mind. Now, after a lengthy hiatus from recording, Ferrell says she is completing work on a project that will show just how much she has grown – both individually and as an artist. As she embraces the joy that comes with loving one’s self, Ferrell also notes that she hopes young, aspiring vocalists will realize that anything worth having, like a successful career in music, takes time and effort.